« What Happened This Week – Doom For Everyone! It all comes down to this: Courier vs. Courier, Trouble in the Rubble, the Exchange on the Interchange. 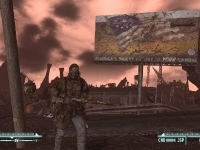 Lonesome Road starts with no fanfare other than questions lingering since Fallout New Vegas began. Ulysses, the original courier slated to deliver the fateful Platinum Chip, offers you nothing more than the reason he turned down the job. The Road itself offers more, from the usual DLC bonuses to a suitably epic climax, guest starring a friendly face from the Mojave. While the content certainly has its high points, it commits you to a linear slugfest and short-changes the narrative where it should have put the most effort. It’s engaging in the beginning, but for content that promised answers it’s not well prepared to give them. Lonesome Road explains the history between the two couriers and can potentially grant bonuses that carry over to the Mojave. 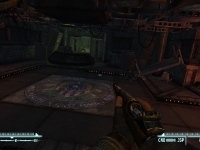 However, it makes no substantial gameplay alterations and the core New Vegas plot is unchanged. Thus, the content will not be scored separately. C’mon, ED-E. Let’s go tell a stalker to get out of here. Although the Road doesn’t feel truly separate from the Mojave, the actual landscape of the Divide is thoroughly inhospitable. Prewar ruins lie in ghastly disarray, with buildings knocked over to crazy angles and deep chasms ripped in the very ground. What’s left of a highway weaves precariously through collapsed tunnels and crumbling interchanges. Harsh dust storms constantly sweep the area with ugly, rust-colored clouds blotting out the sky. Signs of the region’s storied past dot the area, from an empty barracks to overturned supply trucks to derelict – but still functional – missile silos. More recent inhabitants have even built crude dwellings in the shattered ruins, suggesting that some kind of life manages to carry on in this desolate place. Befitting the setting, Lonesome Road‘s inhabitants are a vicious lot, if less than diverse. You’ll mostly square off against the mutated Marked Men, humanoid opponents who look as if they’ve been skinned alive and have the temperament to match. Similar in function to non-feral ghouls, they’ll come at you with a variety of scavenged NCR and Legion gear on top of DLC additions. Expect anything from thermic lances to anti-materiel rifles if you’re going in above level 30. Grotesque tunnelers are the other new addition, clawing their way up from underground to swarm and overwhelm their prey, while common and unique flavors of deathclaw periodically offer sturdier targets. Satchel charges serve as less mobile hazards, effectively mines that pack a bigger punch and a deviously short fuse. It’d be remiss not to mention Ulysses, whom you eventually meet in the flesh, and suffice it to say he’s no pushover even by endgame standards. 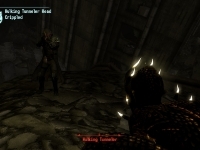 At times, however, combat leans too heavily on hard-hitting, fast-moving enemies. Road tends to stuff a few of them into narrow corridors and tell you to deal with it, mandating liberal use of your more powerful toys. An elevator sequence locks you in a fight with a swarm of tunnelers, evocative of Dead Space but more tedious than tense. It’s not unreasonable to expect a level 25-and-up player to be ready for trouble, but New Vegas and its Bethesda-born predecessor allowed far more versatility in combat. Stealth is impractical barring copious use of stealth boys, and you often won’t have the distance needed to snipe or use heavy artillery. On top of this, the short fuse of satchel charges makes them exceedingly dangerous without the Light Step perk. More than a couple had either sunk into the environment or were simply invisible, leading to fruitless (and brief) searches to disarm them. 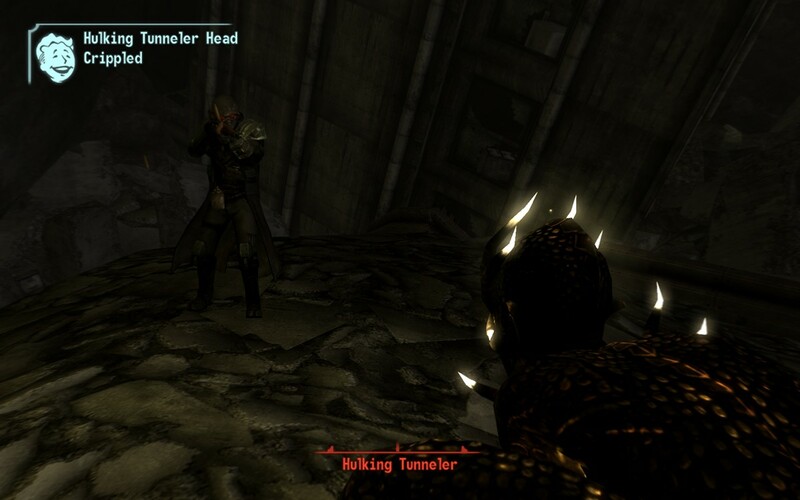 A tunneler even clipped into the ground once, freely attacking from below while being virtually impossible to kill. Fortunately, your equipment has seen some inventive additions. Red Glare takes center stage as an automatic rocket launcher, complete with crafting recipes for its miniature rockets. Several weapons are improvised from tools – nailguns, arc welders, a fist-mounted industrial saw – while a handy shoulder-mounted machine gun does the job of a minigun with more common 10mm rounds. Flare guns can blind or frighten targets in addition to dealing fire damage over time, while flashbangs can frenzy tunnelers so they’ll fight each other. New armor isn’t quite as inspired, though custom faction-specific dusters and a neutral set of ranger armor are worth seeking out. Miscellaneous goodies tend towards the mundane but useful, such as auto-inject stimpacks and MREs (Meals Ready to Eat) that restore a sizable amount of health over time. As in Honest Hearts, most of the rare items are conveniently placed in a box upon clearing the content, including a few you can only get from Ulysses himself. 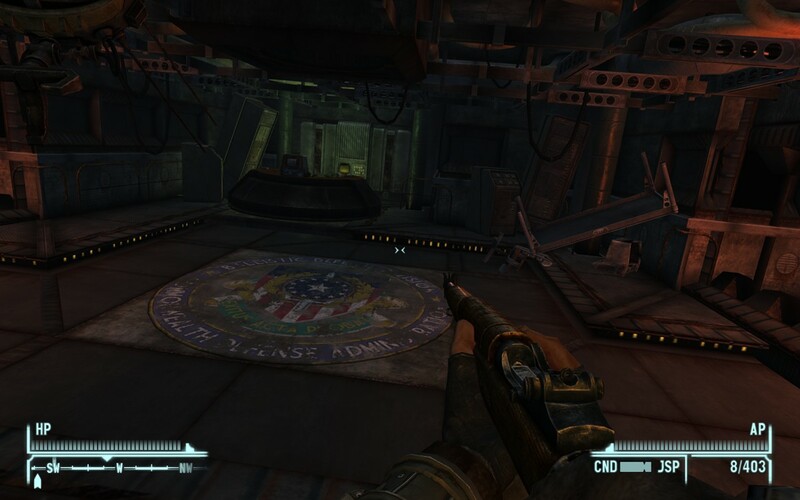 A few extra-unique items are accessible only depending on a choice you make in the finale, which makes a small but cool “adjustment” to the Mojave. Anybody else slightly worried that this place, of all things, looks relatively intact? One of the largest changes is to ED-E, who can’t follow you in but joins you early in the adventure. Technically a copy of the original, ED-E can be upgraded by finding special circuit boards on destroyed eyebots. Some simply boost your stats or detection range, though your robot buddy can learn to synthesize energy weapon ammo or serve as a mobile crafting station. These upgrades transfer to the copy back in the Mojave, turning the flying suitcase-slash-laser platform into a truly versatile ally. Apart from being plot critical, ED-E also unlocks the above-mentioned commissaries. Internal audio logs detail further steps in its cross-country adventure, deliberately paralleled with movie posters about a military robot fleeing cruel government experiments. While not the most original concept, it gives ED-E room to emote through expressive beeps and chirps, and it’s hard not to appreciate the little guy’s determination. Smaller details help bolster the atmosphere. Marked Men carry faction-specific equipment and trinkets, hinting at their former allegiances even as they fight you together. Flares rocket up as you enter new areas, suggesting the Marked Men are aware someone is nearby; a purely cosmetic touch, but a nice one. Buildings teeter precariously over the side of cliffs, sometimes crumbling at scripted points to block the path in front of you. The ground shakes with distant explosions as you draw closer to Ulysses, mere hints of the confrontation to come. Your stalker will sometimes hijack ED-E to speak directly to you, unveiling more of what happened here both before and after the war. You’re required to trigger certain loose warheads with a laser detonator, clearing obstructions and potentially taking out groups of hostiles. Sometimes this feels more like an invisible wall remover, but at least there’s spectacle involved. As for the star of the content, Ulysses is well served by actor Roger Cross and his impossibly gravelly voice. Between audio recordings and verbal exchanges he gives the impression of a man who has seen enough to last two lifetimes; a disillusioned adventurer-philosopher with a roundabout fixation on you. He speaks at a languid pace, pronouncing every last syllable with unhurried precision. Unfortunately this makes it easier to spot problems with the narrative, as the overly verbose dialogue has a habit of using a bomb when a dagger will do. Ulysses spends a lot of flowery words to explain otherwise simple things, such as the origin of the Marked Men or the nature of the Divide’s machinery. He talks of America still sleeping, people carrying messages without realizing it, and ideas that found nations. While interesting subject matter, he tends to repeat himself and the actual plot isn’t nearly so complicated. After a while it becomes tempting to start skipping lines until he gets to the point. The larger issue is the story skimps on details where they’re most needed. 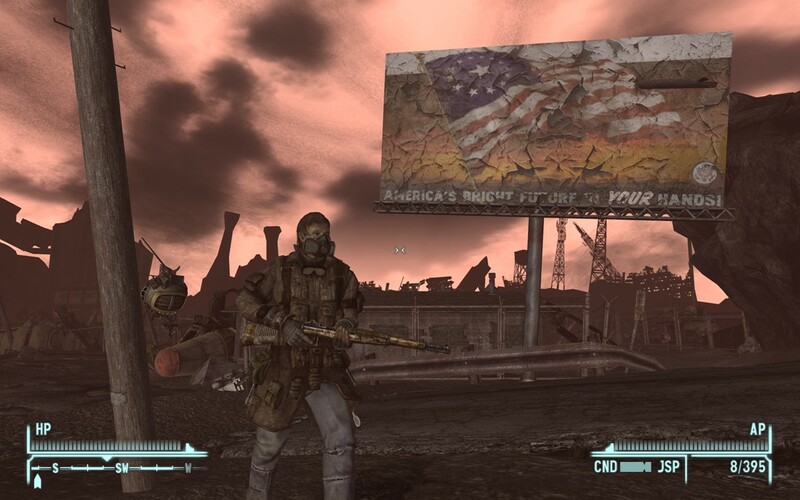 Much of Ulysses’ motivation hinges on the existence of a town in the Divide, resting on a crucial supply line for the NCR until destroyed by a cataclysmic event. He calls it a ‘home’ of sorts, placing a great deal of importance on it and suggesting you were critical to its founding. After extensive searching and multiple playthroughs I found nothing to suggest this town ever existed, let alone that the Courier had been there. The presence of prewar notes, journal entries, and even bodies makes this omission all the more baffling. Lacking context or proof of your pregame exploits, there’s no sense of attachment to this supposed place and Ulysses’ accusations seem all the more inexplicable. Combined with his tendency to overexplain other things, Lonesome Road can’t shake the impression that it would rather tell because there’s not much to show. The scary thing isn’t this fellow, but the half-dozen of his friends that’ll show up as soon as VATS ends. Which isn’t to say the plot is entirely lacking, in fact much of Ulysses’ backstory is given proper depth. Once an agent of the Legion, Ulysses tells of his encounters with the various parties featured in DLC. One recording of his interaction with the White Leg tribe of Honest Hearts is particularly revealing of his mindset. The final confrontation is well constructed, with the two of you trading either words or bullets, and you can challenge him with his own words if you found all his audio tapes. In a clever twist, this option relies on remembering what he actually said rather than passing a speech check. Still, the spotty premise is poor footing for a climactic showdown, and even diligent players who find everything could be forgiven for asking “Wait, why are we doing this again?” This wouldn’t sting so much if they hadn’t hinted at Ulysses’ adventures in the base game and three prior DLCs, but after all he’s been mentioned it’s hard not to expect something more. Taken as a whole, the content adds enough on the gameplay side to justify the pickup, offering about five to seven hours if you’re thorough. You’re given some room to explore in the fallen buildings and derelict base facilities, and apart from an optional stroll through a nuclear blast crater you shouldn’t need to backtrack much. Would that the content did as much for the story, capping an intriguing mystery with a disjointed, drawn-out explanation. Ultimately, the story of Ulysses and the Courier just doesn’t feel organic in relation to New Vegas, and the long-winded, often redundant dialogue doesn’t help this impression. You are told as early as Dead Money that this confrontation would be important, and that the Courier had a major impact on Ulysses’ life. You’re told there was life in the Divide, and that the Courier was central to all that happened there. But the journey shows so very little of this, and you’re left with the words of a bitter nihilist who just says it’s all your fault. Good setpieces, heavy action, a charming subplot, and sizable gameplay bonuses do make this a reasonable pickup. As Ulysses points out, however, you’re here because you wanted answers. You’ll find them, but after so much buildup it’s just not the grand finale the story deserves. This content was played to completion with a digital download copy purchased through Steam.